Michael Porter thinks the healthcare system is transforming into a system based on value rather than services. At Clinical Congress 2018, he urged attendees to “be leaders in this transformation, rather than be dragged along.” He believes such a transformation is necessary because healthcare costs are unsustainable: they’re rising faster than GDP and income in most developed countries. So how can healthcare costs be reduced? Porter notes that incremental improvements to cut costs have not succeeded. He advocates instead for a restructuring of healthcare toward a focus on a single goal: improving value for patients. Precision OS partner, Jon “J.P.” Warner M.D., believes healthcare providers should learn from Porter’s Virtuous Circle of Value, which emphasizes the importance of volume: a higher number of patients with the same condition enables higher value for patients. Dr. Warner is an orthopedic surgeon at the Boston Shoulder Institute and co-author of an article published in Arthroscopy Journal examining the relationship between volume and outcomes in surgery. He points out that research shows that low-volume providers are associated with longer hospital stays, longer operating room times, increased hospital complications, and higher costs. However, he also notes that the effect of volume on outcomes is lower in cases where orthopedic residency training provides greater exposure (as in total hip and knee arthroplasty, for example). To deliver more value to patients, healthcare providers must either improve surgical outcomes or decrease costs. 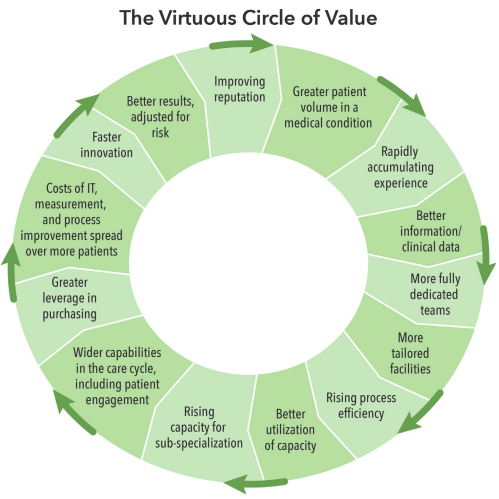 Porter has studied the effect of surgery volume on outcomes and value in healthcare and proposed a “Virtuous Circle of Value” based on the volume of care (see figure below). Source: Volume and Outcome: 100 Years of Perspective on Value From E.A. Codman to M.E. Porter, reprinted from Porter and Kaplan’s “How to pay for healthcare”. Greater patient volume drives a positive feedback loop of improvements, starting with more experience, better data, rising efficiency, and so on. It’s important to note, however, that providers can begin at multiple points in the cycle: increasing volume is not the only way to increase value. Dr. Warner shows that systematic efforts to measure outcomes and improve can also lead to better outcomes. Porter offers the Martini Klinik in Germany as an example of a healthcare provider that has internalized the Virtuous Circle of Value. They created “a hospital within a hospital” that integrates all the elements of care and, most crucially, supports the systematic measurement of outcomes to determine which surgeons are underperforming. When an underperformer at the Martini Klinik is identified, they receive mentorship from better-performing surgeons. As a result, outcomes quickly improve up to the required benchmark. Overall, the Martini Klinik has far lower complication rates than comparable providers. Therefore, volume may be important, but so is the systematic measurement of outcomes. Research performed by Dr. Shahian confirms that measurement of the entire process of care, from preoperative decision making to surgery and aftercare can dramatically improve results. E.A Codman would agree. Dr. Warner concludes that, although volume plays a role in determining value, even more important is the measurement of outcomes and improvements based on these measurements. 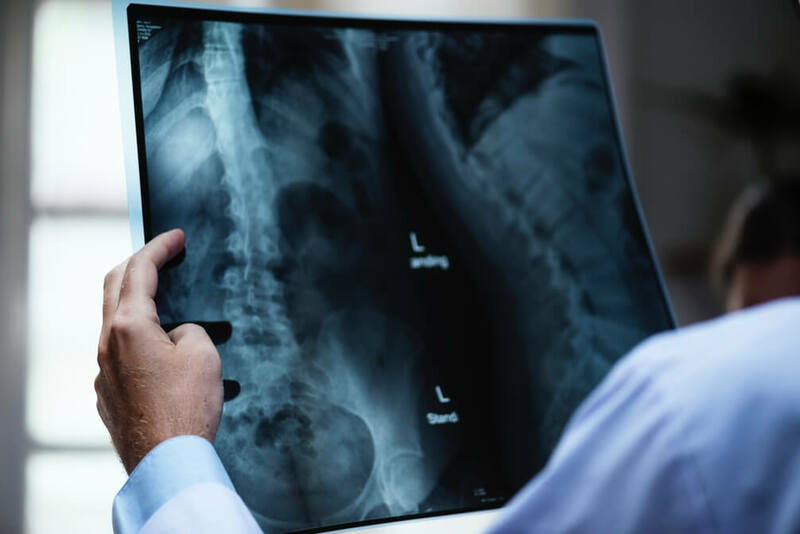 Dr. Warner believes measuring outcomes will become even more important as hospitals move to alternative payment models – and there have already been proposals for the creation of insurance bundles in shoulder arthroplasty and rotator cuff repair. For example, in 1994, Johnson and Becker proposed and delivered a warranty on outcomes for a two-year arthroscopy pilot study and managed to increase profit margins for the hospital and the surgeon involved. Putting the focus on improving outcomes, rather than delivering services, has been shown to be a sound way to reduce costs and increase value for patients. There is a clear association between volume and outcomes (as demonstrated in the Virtuous Circle of Value). However, healthcare providers can also increase patient value through a dedicated approach to measurement, oversight, and hands-on learning and mentorship programs. Returning once more to the Virtuous Circle of Value, the process of measuring and improving outcomes naturally boosts efficiency, improves surgical outcomes, and increases value for patients. As a result, patient volumes increase and surgeons and hospitals see more profit. Healthcare providers can therefore increase value for everyone by instituting a process of continuous learning and improvement. Interested in the PrecisionOS™ platform? Would you like to know more about how we can craft custom experiences for your organization? © 2019 PrecisionOS All rights reserved.